Milos structural systems are well-regarded worldwide for their clean, attractive appearance and wide variety of potential applications, both large and small. They are being utilized indoors as well as out and are especially known for their substantial ratio of weight to load capacity. Made from high-strength aluminum and offered here in its natural silver color and smooth mill finish, they're available in a wide range of sizes and truss component configurations as well as load capacities, from the light-duty M220 Series up to the ultra-high load capacity M950 Series. 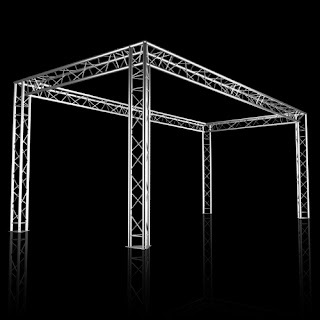 The M290-B Triangle Truss Kit shown here is one of Milos' mid-range load capacity systems, offering excellent spanning/weight loading capabilities for a wide range of event staging, trade shows, etc. It measures 10’ X 20’ and is 8' in height. These measurements make it ideal for the typical trade show booth area measuring 10' X 20', and the 8' in height gives it the advantage of being able to display signage up high where it's visible at a distance across the trade show floor. The M290B Trio is also ideal for staging an array of events and can be utilized as a lighting or sound equipment bearing structure. The 20' front and back spans are both capable of handling up to 700-lbs of weight load, while the 10' side spans will hold more than 1,110-lbs each. This allows for the attachment of heavy equipment like video screens or audio speakers without overtaxing the load capabilities. The Cell 201 – Cell 206 clamps and couplers featured at the bottom of the page are all designed to work with the 2" tubes that comprise this 10’ X 20’ stage truss structure. Their high-quality aluminum extruded composition makes them durable and reliable for mounting any number of fixtures to the truss structure. These clamps and couplers come in various configurations to precisely satisfy your exact mounting requirements. The M290B Trio is one of three options in the M290B Series. Also referred to as the "triangle" because of its triple tube configuration, it is complemented by the duo (or ladder), double-tube truss and the quatro (or box), quadruple-tube truss. All corner junction pieces and base plates in this system correspond to the triple-tube configuration of the trio. Assembling and disassembling the M290B Trio both is quick and easy. It employs a system of conical connectors that fit precisely into CNC-machined receivers and are securely held in place by tapered pins and R-clips that are a snap to put together and take apart. This ease of operation, along with the relative light weight for shipping requirements, are two more outstanding qualities of this superior truss system built to last many, many years.